There are few Universal truths, and when humanity eventually extends its reach to the stars and finally discovers just how insignificant we really are, the number of said truisms will decrease significantly. However, I suspect that one of the remaining constants will inevitably be power. Whether it’s the incalculable, raw power of the cosmos to create and destroy planets, stars and entire solar systems or the individual biological drive and desire to control every aspect of life and destiny, and by doing so assume the mantle of a god, power in all of it many variations, facets and forms lies at the heart of all things. 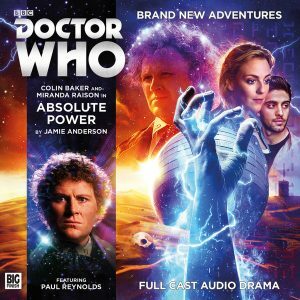 And in the Sixth Doctor and Constance Clarke’s latest adventure, Absolute Power, John Dalberg-Acton’s warning from history about the nature of the indefatigable Universal accuracy visits all involved in spectacular and dramatic fashion. Tipping its hat to The Mummy, The Man Who Would Be King and Quatermass and the Pit and playing out like some glorious old Universal Horror film with a sprinkling of Hammer and pulp Science Fiction, as soon the curtain goes up on Absolute Power it drops into high gear and sets off at full speed. After introducing its eclectic set of characters, none of whom (apart from the Doctor and Constance of course) are what they first seem to be, it dives straight in at the deep end with its story of mysterious ancient artefacts, genocide, colonisation, covert intergalactic assassination squads, cuckoo’s in the nest, duplicity and unrequited love that finds the Tardis crew battling enemies, and discvering allies, on all fronts. It’s an old fashioned adventure that feels more like a black and white Saturday morning chapter play than a twenty first century take and it’s all the better for it as there’s no lulls in its thrill delivery. It actually feels like the Doctor and Constance are in near constant peril and if you pause to catch your breath, you’ll miss something and will almost certainly, once its finished of course, have to go back to the beginning and start it all over again. Which is no bad thing as the more you listen to it, the more you get out of the story, picking up on all of the little things that you missed the during the last five or six times you were submerged in Absolute Power.